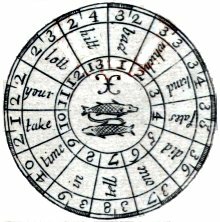 Engraved pack designed for divination, in which every alternate numeral card has an astrological sphere, and the others are filled with fortune-telling answers. The court cards are whole length figures, the Kings and Queens being the same in all four suits, although with different inscriptions. Every card has a ruled off space at the top containing the name of an astrologer, sybil, etc., with a numeral and suitmark to indicate the value. On the Ace of Hearts is Hermes Trismagistus, on the King of Hearts Herod, on the Knave of Spades Wat Tyler and on the Knave of Clubs Hewson, the regicide. Having chosen a question as posed on one of the kings (above) the enquirer is directed into the maze of spheres depicted on half of the numeral cards (1, 3, 5, 7 & 9 each headed with the name of a celebrated sage or magician) and subsequently via the curious indices shown on the queens and jacks to the reputed sayings of famous sibyls of antiquity. 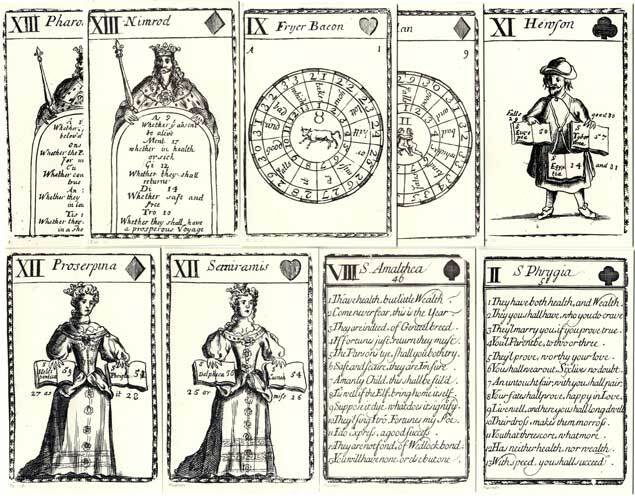 Above: these cards bear, in addition to the usual suit and number markings, figures and diagrams which can be used for fortune telling. There is a contemporary set of instructions in the use of the cards printed on two of the cards, the second of which has the address Sold by John Lenthall, Stationer, at the Talbot against St. Dunstan Church, Fleetstreet, London. The mysterious Hewson on the jack (or XI) of clubs may, in fact, represent the original maker's name; at that time it was usual to give the maker's name on the jack of clubs in ordinary packs, and Hewson was a known card maker of the late 17th century. John Lenthall was a Fleet Street stationer who, in the course of the first quarter of the 18th century re-issued, re-engraved or imported at least forty different packs of pictorial cards. 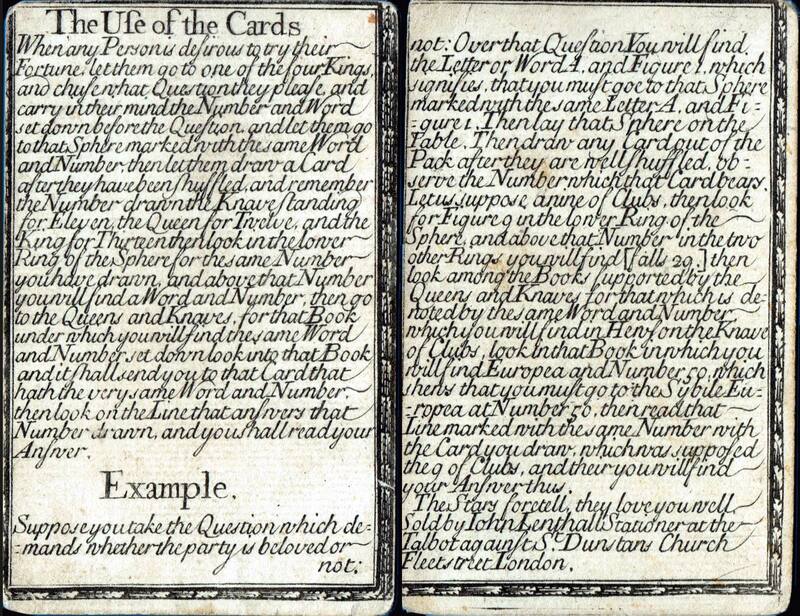 Although these fortune-telling cards are generally known as “Lenthall’s”, the first edition, possibly made by someone else, is advertised as early as 1690.